It has been uneventful day of towing but good things are happening nonetheless. We broke camp this morning in the strongest wind we’ve had at Myrtle Beach yet. It felt like a steady 20+ MPH. I had to hold things down to keep them from blowing away. While towing west, I talked on the phone with a few friends (fellow Airstreamers). Brett is making plans to join us at the International Rally in Oregon this summer. Rich C is going to try to hook up with us in New Mexico and caravan with us for a month or so. Adam and Susan are going to meet us at International and caravan with us to Montana. And in Montana, we’ll meet up with Bert and Janie for a week or so! Meanwhile, Eleanor was on the laptop from the passenger seat, researching flights for our visit home (Vermont). It’s great to be able to make productive use of the road time with the Internet and a cell phone. Emma was in the back chatting on the phone, coloring, playing with her Leap Pad, and playing with her stuffed animals, so we all managed to make the 7+ hours of driving not as horrible as it could have been. And now, here we are … at Cracker Barrel. Tomorrow will be a shorter day of towing. We are going to try to intersperse the long days with short days, as we head 1200 miles west to our next major stop in Weatherford TX. 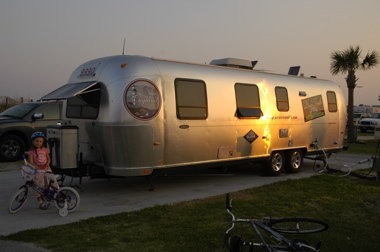 As I mentioned, we are going to have a bunch of cool upgrades done to our rolling home at Roger Williams Airstream in Weatherford, so if you live nearby let me know if you can meet us there! We’re getting disc brakes, solar panels, and some Vista Views too. Should be very interesting to watch! One of my favorite events at a rally is the Vintage Open House. All the owners of trailers 25 years or older throw open the doors to socialize and show off their very cool rigs. Photographically, it’s a great event to attend, but I recommend strong sunglasses on a shiny day. The polished trailers can be hard on the eyes! We often see familiar people at these events. 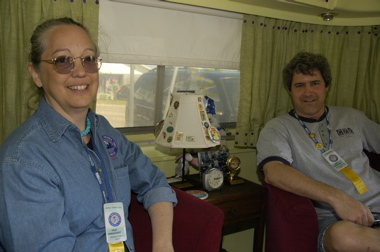 We haven’t seen the folks below, Janea and Ed Whitacre, since last summer at the International Rally in Springfield MO. I’ve been lusting after their 1972 Globetrotter for years, but I can’t convince them to sell it! I went over to Fred Bothwell’s new toyhauler project. 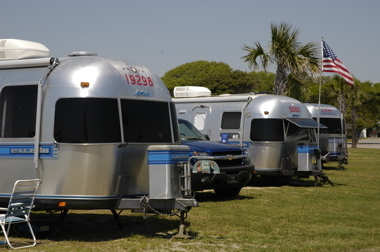 He thinks his cut-down Globetrotter is smaller than the smallest Airstream ever made. No interior yet. It will be perfect to haul his golf cart. What a beautiful day! We lucked out. It’s upper 70s and absolutely gorgous and dry. Perfect for our Open House today. A crowd showed up at 1 pm and hung around until 2:30 (when the official Beach Party was scheduled to begin). A few people checked out our unusual trailer, and others snacked under the awning and asked questions about how we do what we do. A lot of people wanted to know when I worked, and I told them “Whenever I can.” Today, for example, I managed to get two articles edited and uploaded for layout, and started work on a third. Half an hour here, half an hour there, and eventually it gets done. 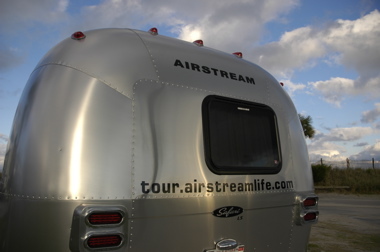 I also got a chance to briefly interview some other folks who had great little innovations in their Airstreams. Those will appear in the Summer magazine. And, best of all, I have been told that the Spring magazine is finally off the press and will be put in the mail this weekend. Then it was off to the Beach Party, which was terrific. 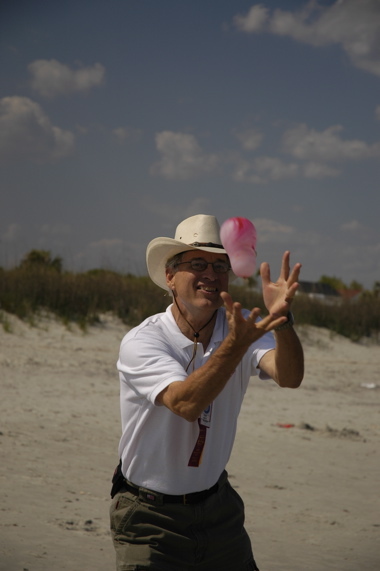 Water balloon tossing contests, kite-flying, digging in the sand for treasure, etc. In the photo above, Emma is competing against a bunch of other “girls”. Now we’ve got a few minutes before the barbecue dinner at the clubhouse. I’m already beat from all the action today, and tomorrow looks to be even busier. Other people relax at rallies. I always need a vacation after one! The rain has gone, leaving behind a blustery sky and a few sandy puddles on the roads. People emerged from their cocoons today to get on with rally business, even though we are on the cold side of the front and the air was a cool 61 degrees most of the day. Brett and I presented our seminar on Mobile Internet and Internet Security. It was a big hit. Over fifty people attended, and we got a lot of compliments. We brought a projector for our Powerpoint presentations, and demonstrated mobile Internet in the room using my Internet In Motion system connected to a wireless router. Everyone who brought a laptop was able to get online while we talked. Eleanor and Emma tried the jewelry-making seminar next, while I caught up on work and interviewed some people for future issues of the magazine. Emma came back with a little bracelet of beads. They also went out to buy some new dishes for the trailer, since we are tired of the plastic plates we have been using. I’ll show you a picture of those in a future post. We spent some time discussing ideas for the next six months. We have a pretty solid plan through July, but then things get murky. With rising fuel prices, it makes sense to try to limit the amount of criss-crossing the country we will do, so instead of driving east we may choose to fly east for a family visit and come back to the trailer in a few weeks. As always, flexibility is key, and so right now we haven’t made a decision on exactly what we will do. Tonight may be one of the coldest we’ve seen since we left San Antonio in February. No sleeping with the windows open tonight — it’s already down to 52 outside. Tomorrow we were planning to serve frozen lemonade for the Open House, but with the change in temperature it may be hot chocolate instead! Everyone here at the rally has been watching the weather carefully over the past few days. We’ve known since Sunday that rain and cooler air were coming on Wednesday. That’s why we went straight for the beach and the warm-weather fun these past two days. It will be only in the low 70s through this weekend. The weather forecasts have become more and more dire with each day, finally culminating in threats of severe thunderstorms and possibly even tornados as the storm front approached today. 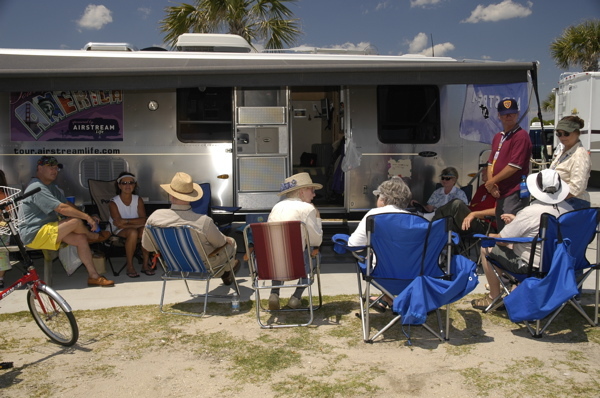 This morning was sunny, warm and humid, and as we sat under the awning having lunch with Renee, Fred, Brett, and a few other Airstreamers, it was hard to believe what was coming. But when you live in an aluminum house, you take thunderstorms seriously. 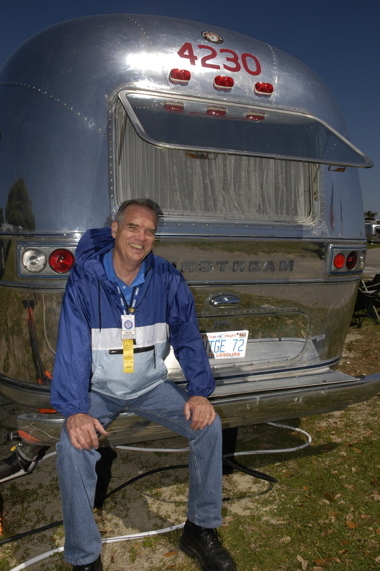 Everyone knows about the hailstorm that damaged hundreds of Airstreams at a big rally in the 1980s. Everyone knows that if the Weather Channel starts talking about “tornadic activity” in the vicinity, it’s time to exit the trailer and head for the cinder block buildings. Unlike when we lived in a conventional house, we aren’t concerned with a power outage, of course. Being self-contained, we have battery power and water to last for several days at least. And while a lightning strike wouldn’t be much fun, the aluminum shell will protect us quite well. Our precautions have been limited to taking down the awning, and securing a few loose items outside. 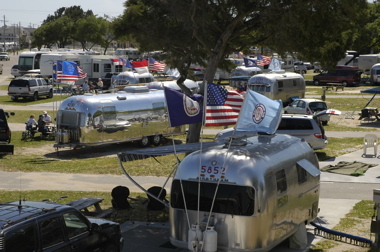 Dozens of trailers have arrived today for the first official day of the rally. About 150 are expected in total. 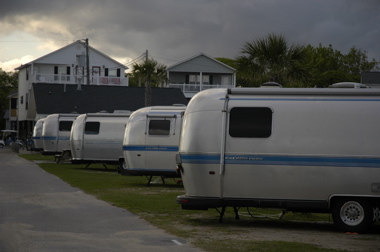 Ocean Lakes Family Campground is now dominated by silver trailers. It’s a rally at last, and we’re looking forward to the activities of the next few days. Tomorrow Brett and I will present our Mobile Internet seminar and Eleanor will go to a jewelry-making class. On Friday we are expecting more than a dozen people to drop by for our Open House (that’s how folks many signed up today), and on Saturday we’ll be busy with the Flea Market and checking out the Vintage Open House. Bert Kalet is here, and he will be talking about the proposed Capetown-to-Cairo caravan in 2009. I’m looking forward to meeting Fred Bothman too. He made the cute “Globehauler” toy hauling trailer that you see in the picture above. 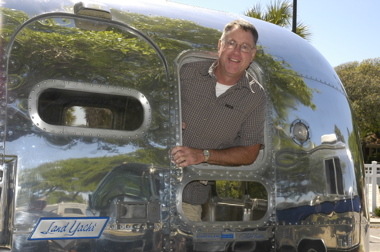 I interviewed him for the upcoming Spring issue of Airstream Life, along with a couple of other guys who have made personal toy haulers out of old Airstreams. Fred will be here conducting a polishing seminar. As you can see from the picture, he knows something about it. Last night we once again were able to sleep with the windows open. It has been balmy and breezy, with sounds of the ocean at night. Emma slept to nearly 11 this morning, so she’s either in a growth spurt again or she’s really getting worn out with all the activity. I love camping near the sea. Today, Brett and I geeked out. We bought a Linksys wireless range extender (model WRE54G) and experimented with using it to connect to the campground wifi at long distance. See, usually when we get to a campground with “wifi at every site” I can’t actually access it inside the aluminum shield of the Airstream. With the range extender, I hope to amplify the signal so I can access it inside the trailer. So we made a minor spectacle of ourselves as we marched around the campground, plugging the range extender into various power outlets to test the range of the device. At one point we even had it mounted on a flag pole. Our tests were not conclusive but so far things look good, so I’m going to keep it for further testing at another campground. Eleanor and Emma spent half the day at the beach again, and this time Eleanor came back with a marvelous swimsuit-patterned sunburn on her back. That’ll be a souvenir she won’t soon forget. 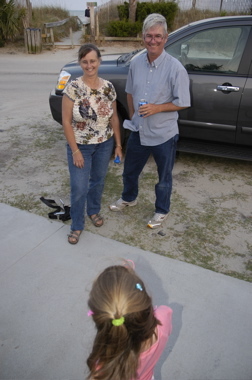 This evening before we headed out for a round of mini-golf, we had a visit from blog readers David & Denese Lee. They are parked just down the way from us. We are hoping to be able to courtesy park at their place in North Carolina someday. 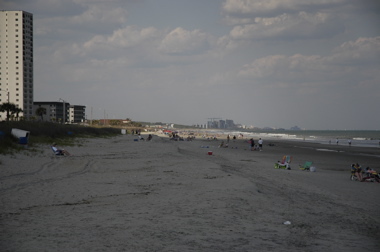 It’s been another beautiful day in Myrtle Beach. And now, at 10 pm, I’m paying for it with a couple of hours of work at the computer. It’s a good trade. We’re spread out now. 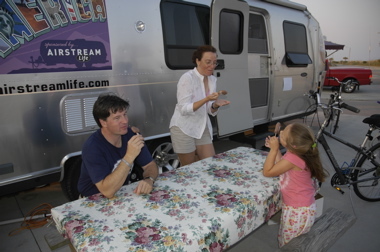 Bikes are off the roof, the big red numbers are hanging off the front of the trailer, the awning is out, tablecloth is on the picnic table, and the beach toys are sitting by the entrance. We’ve got sand on the floor, and cold drinks in the fridge. Beach time! Sadly, even though the weather has been just fabulous, I’ve spent most of the day working. But I did manage a few breaks in between projects, and some visitors have dropped in, too. People are arriving for the rally every day, even though the official start isn’t until Wednesday. Eleanor and Emma hit the beach in the afternoon and found that while the sand is warm, the water is cold. 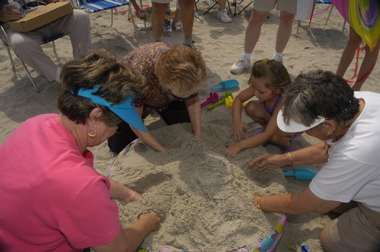 Making sand castles, kite-flying, and straying knee-deep in the water are probably the optimum uses of this beach. I haven’t been able to locate a flag pole holder kit here yet, but I do have three flag poles and two flags. 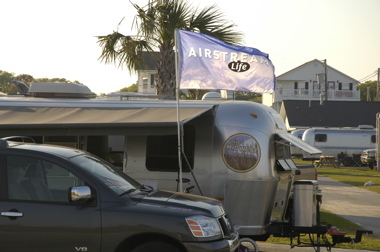 We set up the new Airstream Life flag as a test just to see how it looks. What do you think? We don’t intend to do much this week … by our standards, anyway. It’s just too comfortable and lazy here in the warm breeze. 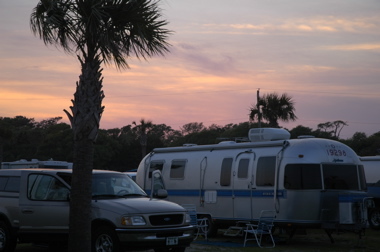 Cycling around the campground, walking the sand, playing games, and grilling outside are the priorities of the week. I have some work to do but I’ll try to do it when the sun is down. There are small pleasures in just puttering, whether that’s with a sand bucket and plastic shovel, or a recipe in the kitchen.